We have already noted the Times‘ misleading report of the assault on US student Francesco Hounye, which tried to link the attack to earlier incidents involving the so-called Muslim patrol, in the absence of any evidence whatsoever to indicate such a connection. 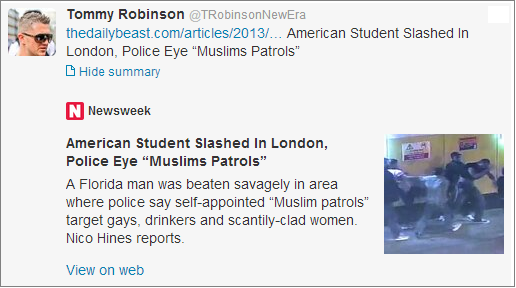 Taking its cue from the Times, and ratcheting up the Islamophobic content a few more notches, the Daily Beast also covered the story, under the headline “American student slashed in London, police eye ‘Muslims patrols'”. The author of this piece, the Daily Beast‘s London editor Nico Hines, produces no statement by the police that they suspect the attackers may be connected to the “Muslims patrols”, because of course the police have made no such statement. Hines reports that Detective Constable Ben Mott “called upon the Muslim community to identify the men who left a tourist scarred for life”. But DC Mott made no reference to Muslims. Police described the suspects as Asian and “possibly Bengali”. Now, who do you suppose seized on Hines’ inaccurate and inflammatory report to spread another poisonous story about Muslims. No prizes for guessing that it was Stephen Lennon, former leader of the English Defence League. Unless the Daily Beast wants to destroy any credibility it may have for reliable journalism, it would be advised to remove the article and sack its London editor.